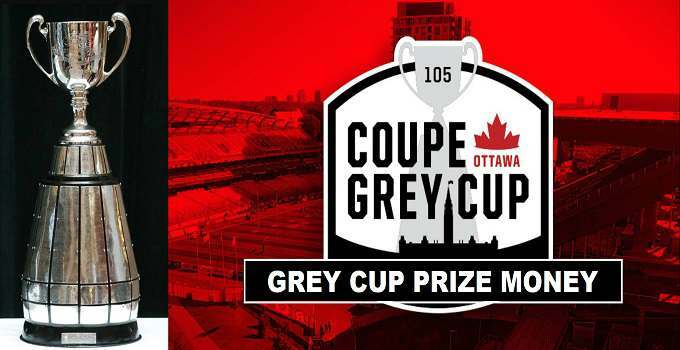 105th Grey Cup will take place at TD Place Stadium in Ottawa, Canada. Upcoming grey cup final played on 26th November 2017. The big bonus prize money awarded to the winning team and runner-ups of the tournament. Almost $200k generated prize money distributed among the two teams players. The winners will paid extra money as compared to the losing side. Most valuable player get paid money bonus. The winning team players of Grey Cup 105th will receive $16,000 in 2017. In 2016, Ottawa Redblacks players earned $16k each last year from the competition. The players of Calgary Stampeders received $8k each in 104th grey cup finishing as runner-ups in competition. There is no information about the increase in the pool prize money of winning team players in Grey Cup. Most valuable player earn ($10,000) bonus money. Last year its (Henry Burris) who received $10,000 valuable prize money award. Extra $5,000 paid to the most valuable Canadian in the final.